We are pleased to be hosting this course starting after Easter. The National Award for Middle Leaders (NAML) is an SSAT (Specialist Schools and Academies Trust) designed course for aspiring, new or established Middle Leaders. Middle leaders have an essential role in translating a school’s vision into practice and the most effective schools seek to continuously develop and build these individuals into high-performing leaders. 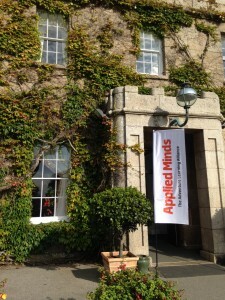 Applied Minds Teaching School is SSAT-approved & licensed to run the course. Our trained trainers from Primary and Secondary phases run the course over a number of two hour twilights. What makes the most effective teaching and learning? The cost for the 6 modules is £200 per person (includes delivery, course materials, registration & certification, refreshments). The course will start at Mounts Bay Academy on Wednesday 19th April at 3:30 – 5:30, then the following 5 Wednesdays finishing on 24th May. Learn to construct basic circuits and program in Python using the RaspberryPi computer. 13:45	What is the RaspberryPi? My name is Simon Elliott and I have been teaching since 1992. I graduated in ‘91 with a BSc. in Chemistry and took a PGCE 1992 in Science and Mathematics. From ‘92-’98, I taught Chemistry at 11-16 before moving into an LEA central team, supporting schools as the NGfL was rolled out with training and development of their IMS. For the last thirteen years I have taught IT from Key Stages 1 to 5, in maintained and independent schools, including boarding. I am now introducing CS at GCSE level and developing Python skills, as well as other IT programmes. I have also written bespoke Challenge Based Learning materials. Over the last two years I have developed an iPad 1:1 scheme developing hardware and software to ensure value for money as well as effective curriculum delivery. I am an Apple Distinguished Educator and the main trainer for the Penzance Apple RTC. I am available for consultancy in Cornwall about integrating digital creativity and Apple products. CAS/NoE as part of the BCS Group will hold your personal data on its computer database and process it in accordance with the Act. This information may be accessed, viewed and used by CAS/NoE for administrative purposes and conducting market research. All of these purposes have been notified to the Commissioner. If you are based outside the European Economic Area (the ‘EEA’), information about you may be transferred outside the EEA in accordance with the requirements of the Act. KeyNote is a powerful multimedia presentation tool, so before jumping to PowerPoint, investigate the amazing things possible with this program, which incidentally comes free on a new iPad and which can read or write PowerPoint files. Attendees should bring sample materials that they would want to present, in order to give you a focus for this practical session. You are welcome on this course to explore using an iPad. This course is for those who might be complete beginners with technology or those familiar with other computing platforms (Windows, MacOS or Android) and explains the core areas of using an iPad for day-to-day work. We will look at setting up an iPad up, including adding email, how to add apps and those which are useful for letting your iPad feel more like a full computer. All questions answered! We have iPads to use, but if you have yours, please bring along. Park on Boscathnoe Lane. Please bring photo ID. If have an interest in coding and finding out more about the RaspberryPi, then this course is for you. Friday 27th January 2017 at Mounts Bay Academy Pi Suite. We will look at both the Python3 language and its use on the RaspberryPi computing platform (although the work will be transferrable to other systems running IDLE3). We will investigate all areas of code development and you will leave with a confidence in using this popular language in the upper KS2 (Year 6) to KS4 (Year 11) curriculum. You will also take away fully editable materials to use with your own classes. Although aimed at teachers, this workshop is also suitable for those in the community with a particular interest in coding. You can park along Boscathnoe Lane and please bring photo ID. My name is Simon Elliott and I have been teaching since 1992. For the last thirteen years I have taught IT from Key Stages 1 to 5, in maintained and independent schools, including boarding. I am now introducing CS at GCSE level and developing Python skills, as well as other IT programmes. I have also written bespoke Challenge Based Learning materials. Over the last two years I have developed an iPad 1:1 scheme developing hardware and software to ensure value for money as well as effective curriculum delivery. I am an Apple Distinguished Educator and the main trainer for the Penzance Apple RTC. 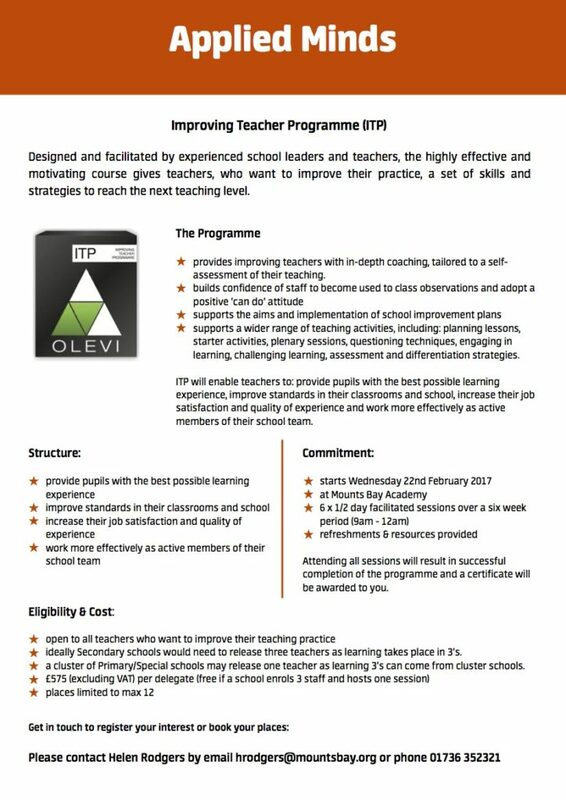 We are running this essential course soon, ideal for teachers who want to gain a set of skills and strategies to reach the next teaching level. There is much confusion surrounding the difference between these terms. PGCE is an academic award at Level 6 or 7. It usually is immersed as part of a teacher training course. It doesn’t qualify you to teach. It does give you Masters Level credits which is useful if you are looking to do a Masters at some point. Teacher training is either School-led or University-led. All training teachers have to spend at least 120 days training in school. School Direct means the training year is largely based in school and generally more ‘immersive’ than a University-led course. School Direct courses can come with or without a PGCE. QTS (Qualified Teacher Status) is the most important – through the year your progress is measured and assessed against the Teachers’ Standards to ensure you meet at least the minimum standard in each one. You aim to gain QTS at the end of the course and then progress into your NQT year. We have a new date for our FREE CPD day with Stormfront – one of the UK’s largest education Apple partner. The day will feature keynote speakers who will share their experiences of teaching and learning with Apple technology in a practical way. There will also be workshops delivered by Apple Distinguished Educators plus, Stormfront will showcase how the Apple ecosystem for education can be used to create powerful and personalised learning experiences. Bring content for learning to live with your own immersive multimedia books. Learn how to create an iBook using your existing materials and add interactive elements and assessment tools. See how apps like Showbie and Book Creator allow for a rich content creation experience with tools to provide assessment and feedback as well as differentiation. Explore iTunes U, the world’s largest free source of education content. Create your own courses to share with students, learn how to set homework, manage hand-in, and mark work. Use sensors and data loggers as well as augmented reality to creatively bring the Science curriculum to life. Spend the day with two amazing and inspiring speakers who will be with us at our Conference on 8th July – book now to avoid missing out! We are so pleased to have them both in Cornwall and you will want to hear what they have to share.